With a desire for more details — including those relating to alerting the public and the potential for greater Code Enforcement costs — the County Commission voted unanimously this week to hold another discussion about a possible change in the county’s residential right of way mowing policy that might save hundreds of thousands of dollars each year. 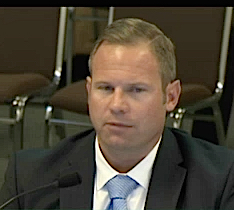 Spencer Anderson, senior manager in the county’s Public Works Department, recommended the board adopt a policy that would require property owners to maintain rights of ways in residential areas except for parcels “in their natural or undeveloped state,” saying the county is paying close to $700,000 annually for that work. However, Anderson pointed out that when county policy at one time required quarterly mowing of rights of way, that led to Code Enforcement problems. The officers had difficulty enforcing a county regulation dictating that grass in yards be no higher than 12 inches, Anderson said, because the grass in some rights of way was taller than that. 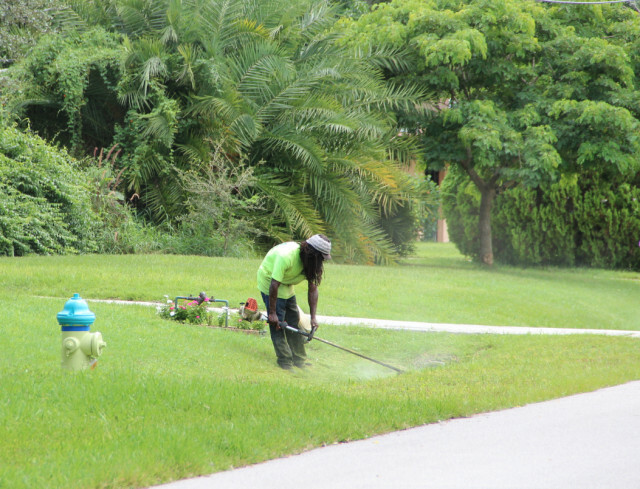 Therefore, Anderson said, in the 2013 fiscal year, the county began including monthly mowing cycles in its contracts. However, on Sept. 8, 2013, the County Commission opted for eight annual cycles, with higher rates of mowing in the summer months than in the fall and winter. 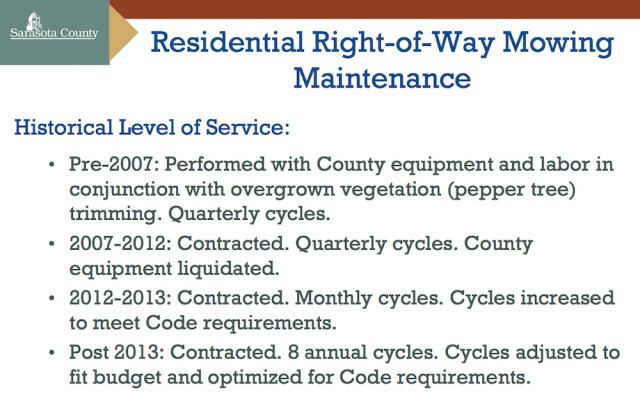 The county contracts for maintenance of 704 miles and 1,305 acres of residential rights of ways, he told the board. In the 2015 fiscal year, that cost $644,417.50, he added. 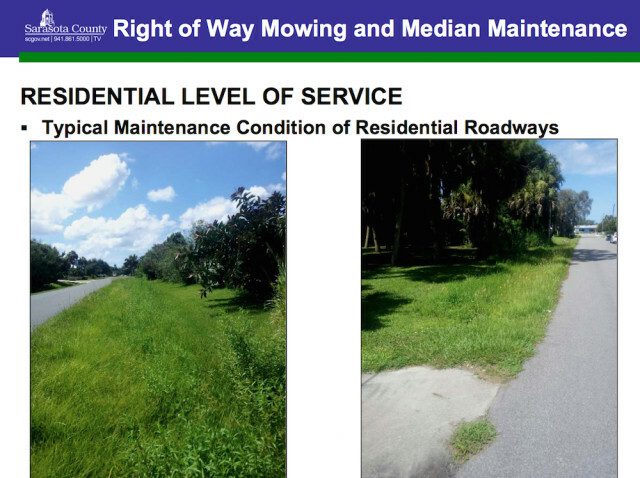 During his presentation, Anderson provided a slide showing that only St. Lucie and Pinellas counties have higher levels of service than Sarasota County. About five of the counties staff contacted do not maintain residential rights of way at all, he noted. 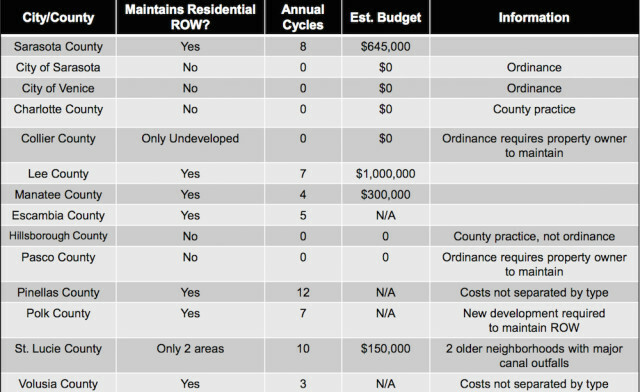 Pinellas County has 12 annual cycles for such mowing, the chart shows, while St. Lucie County has 10, but it maintains residential rights of way in only two older neighborhoods with major canal outfalls. The Cities of Sarasota, North Port and Venice do not offer the service, Anderson pointed out, though he had no information about the Town of Longboat Key. Commissioner Carolyn Mason asked whether “the smaller — for lack of a better term — ditches, the not-so-deep ones that I readily think of,” such as those on 19th Street between Tuttle and Euclid, are the types to which the revised policy would apply. He told her that was correct: those of a reasonable depth that a property owner could take care of with a weed-eater or a mower. In a list of potential impacts from the recommended change, Anderson then noted that one might be increased demand for Code Enforcement services. Additionally, residents might complain more about the look of their neighborhoods. When Vice Chair Paul Caragiulo asked whether county staff had looked into the cost of cutting areas that would be hard for property owners to reach because of depth, Anderson told him staff could do that “on a case-by-case basis.” Anderson added, “It’s not terribly difficult” for the average person to use a weed-eater to handle such areas. In fact, he explained, such equipment is what the contracted crews use. “It’s $700,000,” Chair Al Maio said of the anticipated annual expense. Nonetheless, Maio continued, the board needed to consider how many deep ditches the county still would have to pay to mow and how much extra Code Enforcement expense might be involved. Referring to the latter aspect of the matter, Commissioner Christine Robinson told her colleagues, “That’s a real sticking point for me.” Last year, she pointed out, the board split on a vote that resulted in the hiring of more Code Enforcement staff. At the last budget workshop, she continued, she requested a staff analysis of how Code Enforcement officers spend their time; that has not been delivered yet to the commission. “I don’t accept the statement for additional Code Enforcement resources right now,” Robinson added. When Anderson asked for the board’s support for staff to start working on the public hearing process for the policy change, he noted that the existing mowing contracts will expire at the end of September. The goal is to implement the new policy prior to that time, he said. If the board agreed to his recommendation, Anderson continued, staff also would come back with details about communicating the changes to the public. Then Robinson made a motion to schedule another discussion of the recommendation. That should include details about deep ditches the county would need to continue to maintain, as well as the number of residential roads that would be affected and the report on the Code Enforcement services, plus a better accounting of the potential savings. “I don’t think this is right to set a public hearing,” she said, without having all that information. Given the prospect of greater need for Code Enforcement attention to neighborhoods if the policy were changed, she pointed out, the savings might not reach the level Anderson predicted. “I think that’s a well-stated motion,” Maio said. Then Commissioner Charles Hines asked Anderson whether he would have sufficient time to put together all that information and still get a public hearing set for the new policy prior to the end of the existing contracts. Anderson replied that he believed most of the mowing contracts allow for 60-day extensions, so he did not foresee any problem with timing.